Colten Treu was surrounded by officers as he was led into Chippewa County Court on Friday. Treu, 22, is charged with four counts of homicide by intoxicated use of a vehicle, four counts of hit and run-involving death, and one count each of hit and run-causing great bodily harm, intentionally abusing hazardous materials and bail jumping. Treu is accused of huffing from an aerosol canister, then crashing his pickup truck into members of Girl Scout Troop 3055, killing four people, as they were picking up trash on Highway P in Lake Hallie, south of the Highway 29 overpass. View more photos at LeaderTelegramPhotos.com. 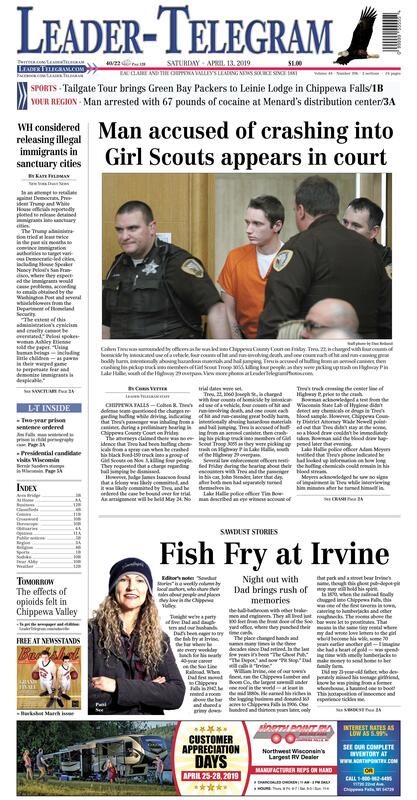 Colten Treu was led into Chippewa County Court on Friday. Treu, 22, 1060 Joseph St., is charged with four counts of homicide by intoxicated use of a vehicle, four counts of hit and run-involving death, and one count each of hit and run-causing great bodily harm, intentionally abusing hazardous materials and bail jumping. Treu is accused of huffing from an aerosol canister, then crashing his pickup truck into members of Girl Scout Troop 3055, killing four people, as they were picking up trash on Highway P in Lake Hallie, south of the Highway 29 overpass. View more photos at LeaderTelegramPhotos.com. CHIPPEWA FALLS — Colten R. Treu’s defense team questioned the charges regarding huffing while driving, indicating that Treu’s passenger was inhaling from a canister, during a preliminary hearing in Chippewa County Court on Friday. The attorneys claimed there was no evidence that Treu had been huffing chemicals from a spray can when he crashed his black Ford-150 truck into a group of Girl Scouts on Nov. 3, killing four people. They requested that a charge regarding bail jumping be dismissed. However, Judge James Isaacson found that a felony was likely committed, and it was likely committed by Treu, and he ordered the case be bound over for trial. An arraignment will be held May 24. No trial dates were set. Treu, 22, 1060 Joseph St., is charged with four counts of homicide by intoxicated use of a vehicle, four counts of hit and run-involving death, and one count each of hit and run-causing great bodily harm, intentionally abusing hazardous materials and bail jumping. Treu is accused of huffing from an aerosol canister, then crashing his pickup truck into members of Girl Scout Troop 3055 as they were picking up trash on Highway P in Lake Hallie, south of the Highway 29 overpass. Several law enforcement officers testified Friday during the hearing about their encounters with Treu and the passenger in his car, John Stender, later that day, after both men had separately turned themselves in. Lake Hallie police officer Tim Bowman described an eye witness account of Treu’s truck crossing the center line of Highway P, prior to the crash. Bowman acknowledged a test from the Wisconsin State Lab of Hygiene didn’t detect any chemicals or drugs in Treu’s blood sample. However, Chippewa County District Attorney Wade Newell pointed out that Treu didn’t stay at the scene, so a blood draw couldn’t be immediately taken. Bowman said the blood draw happened later that evening. Lake Hallie police officer Adam Meyers testified that Treu’s phone indicated he had looked up information on how long the huffing chemicals could remain in his blood stream. Meyers acknowledged he saw no signs of impairment in Treu while interviewing him minutes after he turned himself in. Defense attorney Travis Satorius noted that Treu turned himself in to authorities at 4:33 p.m. — about five hours after the crash occurred. The blood draw was taken after 7 p.m.
“You waited more than three hours to take a blood draw?” Satorius asked Meyers. Meyers described his conversation with Treu about what had occurred. “He made a comment that he remembers hitting someone wearing a visible reflective vest,” Meyers said. Treu told Meyers that Stender had been huffing more than he had, and he claimed that Stender grabbed the steering wheel, leading to the crash. Police officer Todd Johnson testified that Stender told him that they purchased the canister of Dust-off at Walmart, which is less than two miles from where the crash occurred. Stender told Johnson that Treu had let the vehicle drift over the center line, and Stender grabbed the steering wheel — after he had used the air duster — to correct the vehicle’s direction. At the conclusion of the hearing, Isaacson praised the crowd of 50 onlookers for sitting quietly during the hour-long proceeding. “I appreciate your restraint,” Isaacson said. Treu remains incarcerated on a $250,000 cash bond. Treu and Stender were not at the house when officers arrived, but they each turned themselves in later that day. “It was basically an idea that Miller wanted that nobody else wanted to carry out,” a congressional investigator who has spoken to one of the whistleblowers told the Post.